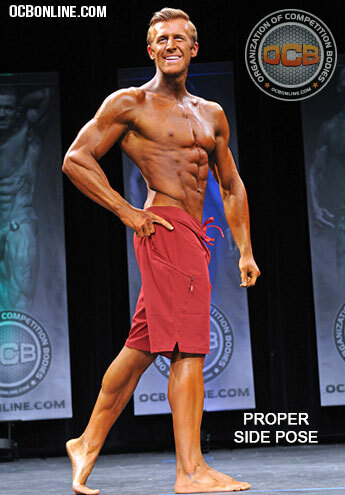 Men's Physique consists of two parts: Group Comparisons and Individual Presentations. Board shorts (loose shorts that come down to around the knee) are worn for both parts. Shorts can be of any color and pattern. Competitors must be age 16 or over. Competitors under 18 must have parental consent. 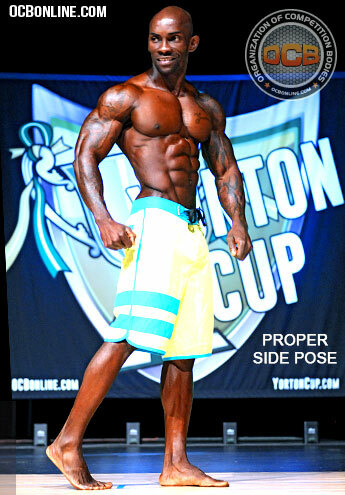 Competitors cannot participate in any other categories at the same show. 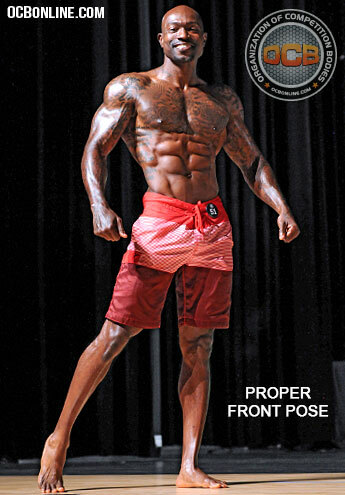 Judging is based on good leanness and definition with full muscularity, and good balance, proportion, symmetry of both muscularity and conditioning, and presentation. 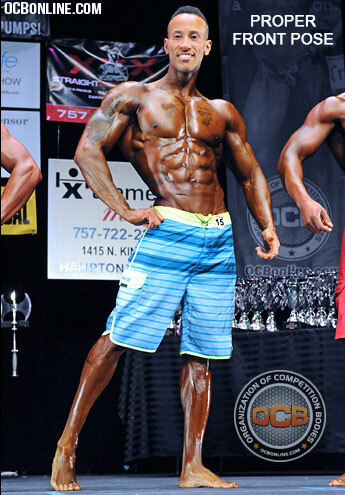 Extreme size and leanness like with the bodybuilding category should be avoided. Each class is brought to front center stage and is guided through quarter turns to display physiques from the front, side, back, and other side. See examples of proper forms above. Not perfoming poses in the manner specified may result in lower scoring from judges. 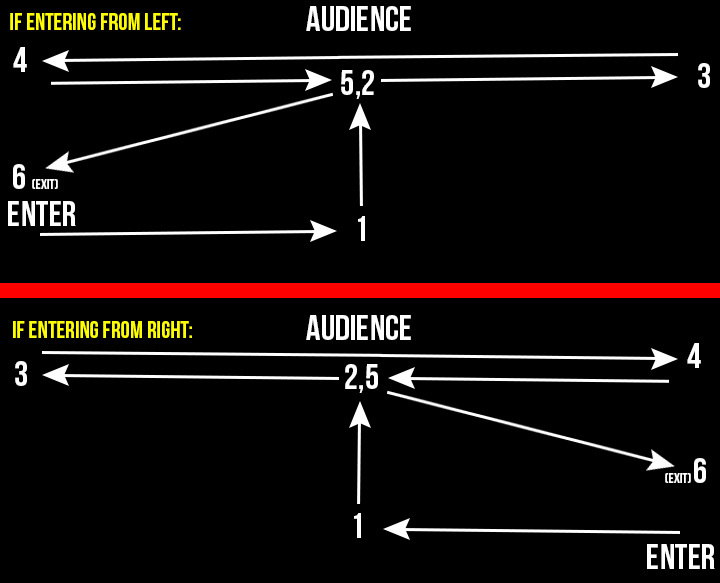 The individual presentation portion is a stage walk. Competitors walk out to music to rear center stage and pause briefly in a stance of choice. 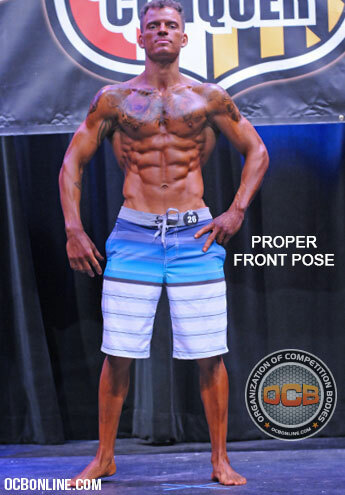 Competitors then walk up to front center stage and perform quarter turns to show front, sides, and back views of their physiques, then walk to one side of the stage and pause briefly in a stance of choice, then to the opposite side of the stage and pause briefly in a stance of choice, then to the front center of the stage and pause briefly in a stance of choice before exiting. The individual presentation is not factored into placement scoring but does count toward consideration for Best Presentation awards when offered.